Bench Plaques made in Brass, Stainless steel and external quality plastics. We can engrave any amount of wording or even incorporate a symbol or design. We have a variety of fonts to choose from. 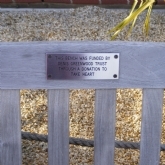 Bench plates make an ideal gift for an anniversary or wedding present or to mark the loss of a loved one. Standard size plaques are usually 150mm x 55mm but can be made to any size.